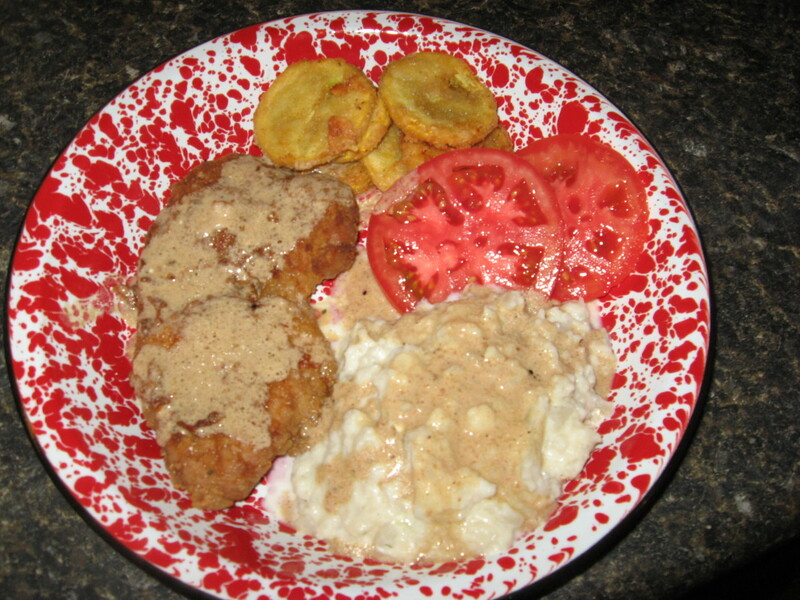 One of my favorite meals growing up in S.C. was fried cubed steak with rice and milk gravy. 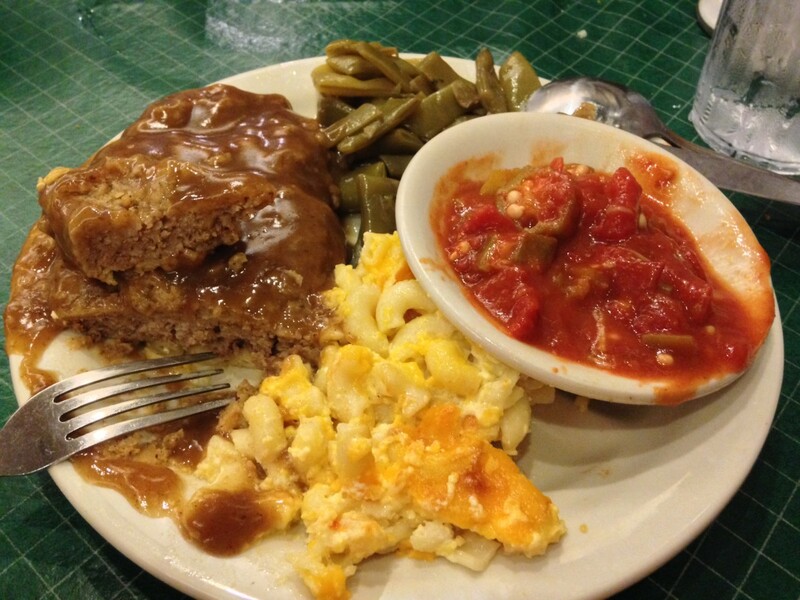 In Texas, many restaurants serve chicken fried steak, which is similar, but it’s not like Mom’s, know what I mean? Several years ago, I saw a great two-part episode of Alton Brown’s Good Eats, which was all about cubed steak. He prepares cubed steak three ways. The episodes, Cubing A Round used to be on YouTube, but were taken down. They are available on Amazon, free to Prime members. The cubed steak episode is episode 4 from season 10. Food Network has posted short videos for Alton's country-style steak and chicken-fried steak. 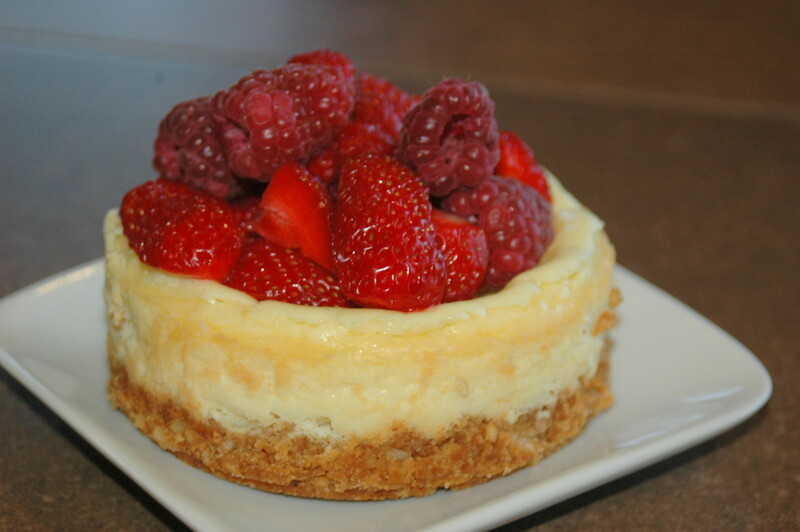 I have included links for his recipes. I also threw in a clip of Gordon Ramsey. Finally, I found a clip of Paula Deen, who prepares cube steak just like Mom. 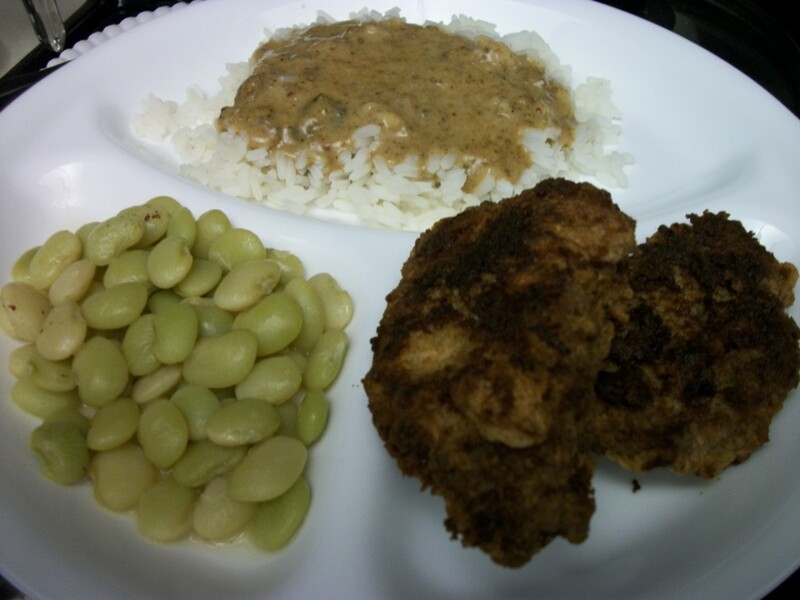 If you’re not familiar with how to fry cubed steak and how to make milk gravy, I think it would be very difficult to pull off from a cookbook. I’m confident you’ll find the videos helpful. 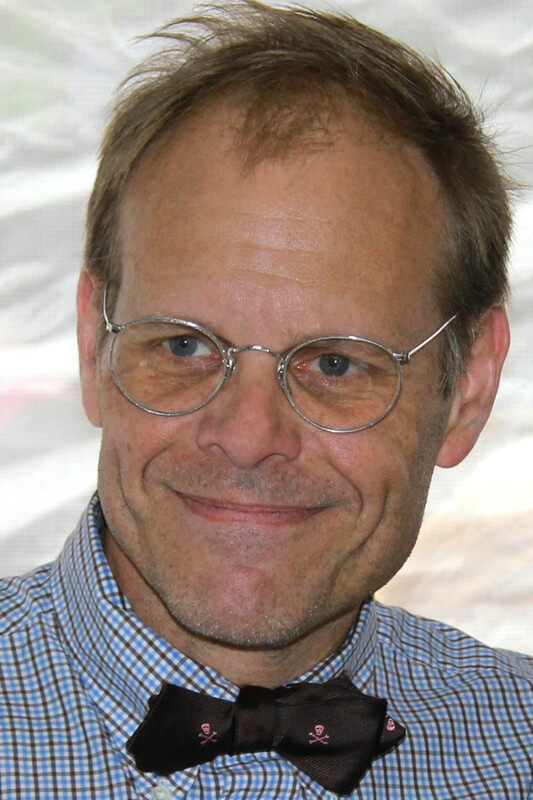 If you’ve never seen Food Network’s Alton Brown on his show Good Eats, be warned that the humor is pretty corny. Make no mistake though, the information is always good. In this episode, divided into two video clips, Brown opens by telling us what cubed steak is, and where it comes from on the cow. I’ve done a summary for you. Cubed steak is perforated in order to make it tender. Technically “cubed steak” can come from any portion of the cow except the shank and heel. Smaller pieces can be “knitted” together, or pieces can be folded. 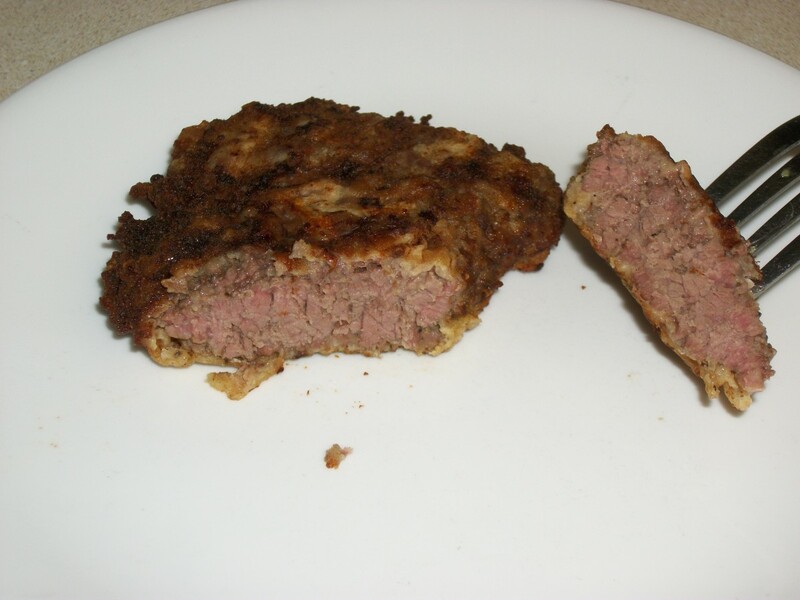 “Beef cubed steak special” comes from the round, loin, rib, or chuck section of the cow. No folding or knitting allowed. Cubed steak most commonly comes from the hindquarter of the cow, the “round”, which is made up of the top round, bottom round, and the knuckle. The meat is flavorful, if a bit tough, because the muscle is well exercised. It is relatively inexpensive. It is perforated to tenderize it. Brown recommends buying bottom round, and having the butcher it cut into ½” thick pieces. Then tenderize it yourself at home. He does not recommend using a meat mallet, as it just “mushes” the meat. I suppose my mom’s method from my childhood would be a “mush” method as well. She pounded it with the opening of a Pepsi bottle. Brown recommends a needler to break down the connective tissue. Brown demonstrates tenderizing the ½” bottom round steaks with a needler. First he dusts each side with flour, then needles each side twice, at right angles. I’ve included a photo of my round needler. Brown’s is rectangular. This episode of Good Eats also includes the “how to” of three different styles of preparing cubed steak. Get this all-star, easy-to-follow Food Network Country Style Steak recipe from Alton Brown. Each piece of steak is seasoned with salt and pepper on each side. After tenderizing the lightly floured steak with the needler, both sides are floured again, and set aside on a wire rack. Heat ¼” of oil in the bottom of a 4 to 5 quart cast iron Dutch oven pot, on the stove top on medium heat. Brown steak, about two minutes per side. 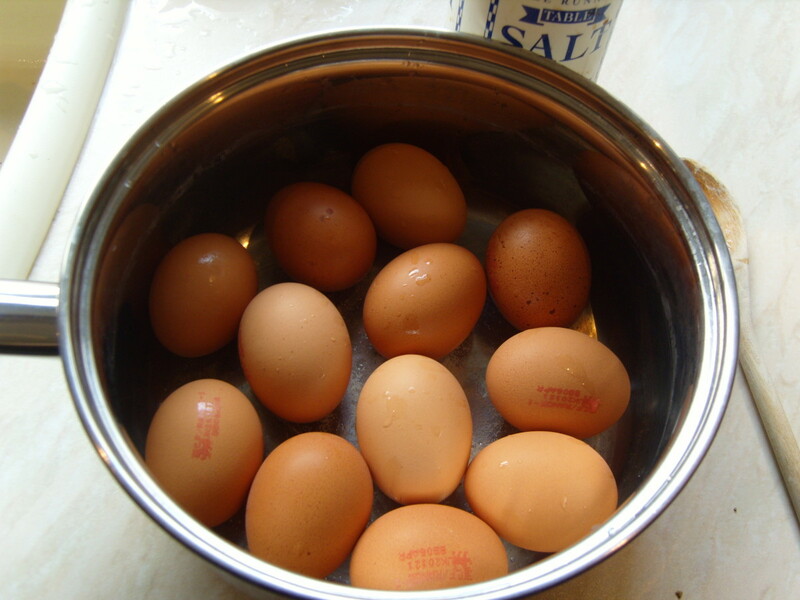 Remove meat to a plate, or the lid of the pot. Deglaze the Dutch oven with chicken broth. Add spices such as thyme. Bring to a boil, whisking. Add meat back to the pot. Cover. Bake in the oven 1½ to 2 hours at 300º. The resulting steak is fork tender. Get this all-star, easy-to-follow Food Network Swiss Steak recipe from Alton Brown. 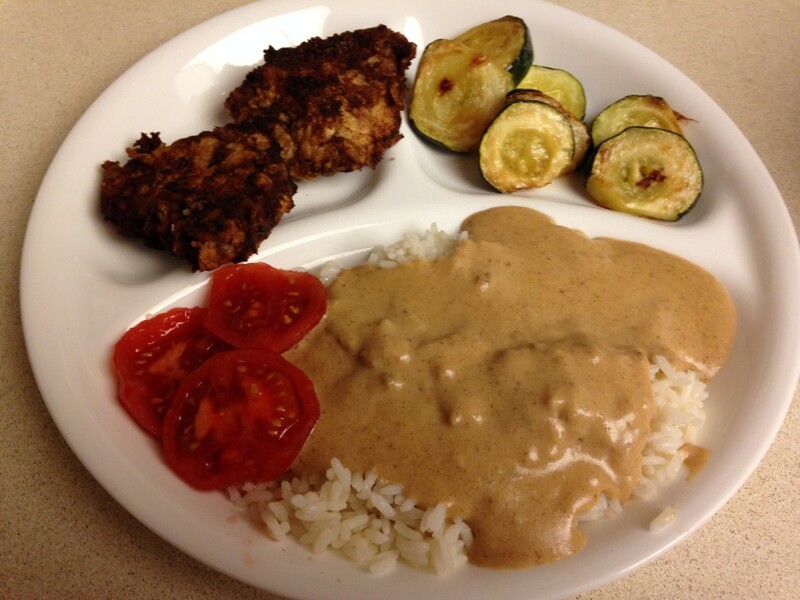 You might think Swiss Steak had something to do with Switzerland. Nope. Alton Brown informs us “swiss” refers to the British swissing machine- fabrics were run through the machine to soften the fabric. Sound familiar? No unlike running round steaks through a cubing machine. 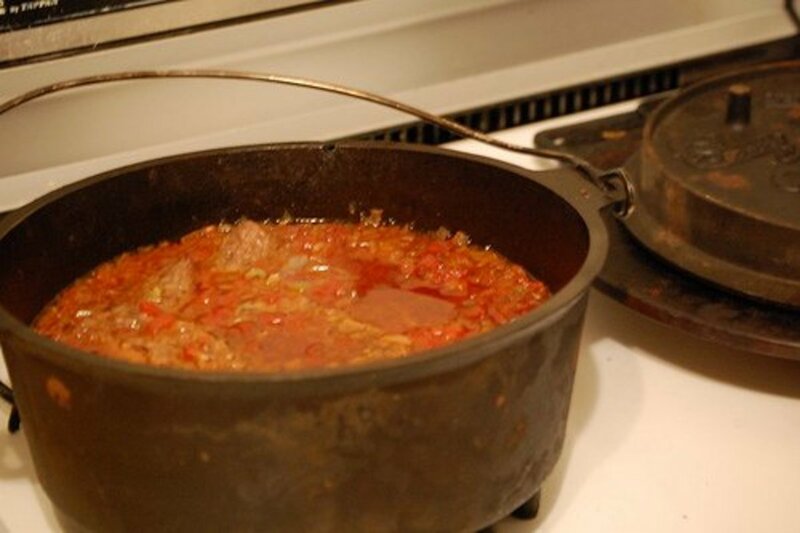 For swiss steak, the cubed steak is tenderized, floured, and pan fried in the Dutch oven same as for country style steak. Then sauté onion, celery, and garlic in the Dutch oven. Add diced tomatoes, tomato paste, Worcestershire Sauce, oregano, smoked paprika, and beef broth. Bring ingredients to a boil. Return steaks to Dutch oven, making sure they are submerged. Cover. Bake in the oven 1½ to 2 hours at 300º. Again, fork tender steak. 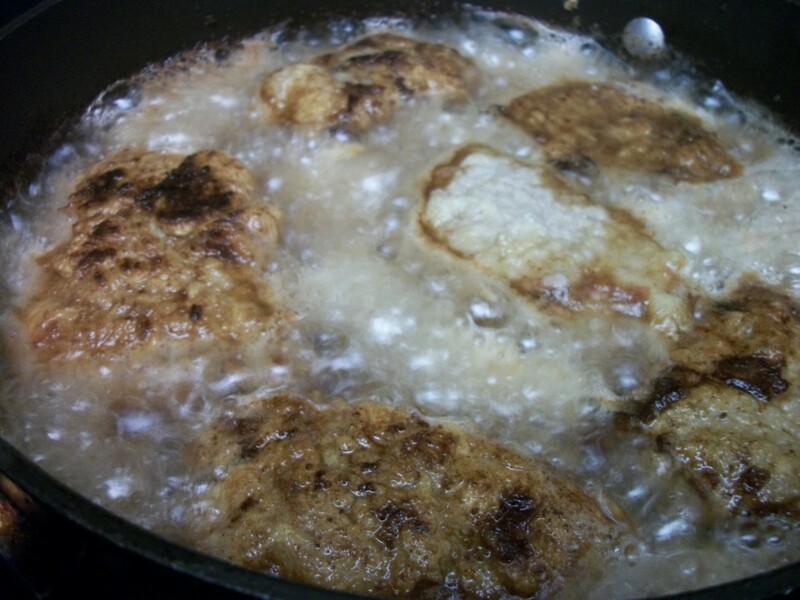 Get this all-star, easy-to-follow Food Network Chicken Fried Steak recipe from Alton Brown. 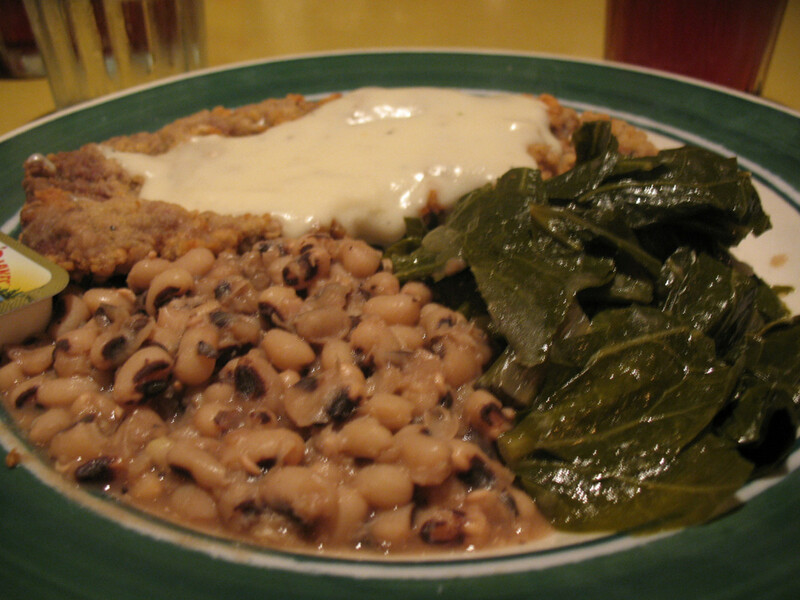 Chicken fried steak is popular in Texas. It is actually based on German wiener schnitzel. There were a lot of German settlers in the Hill Country in towns like Gruene, New Braunfels, and Fredericksburg. I enjoyed schnitzel when I lived in Germany, but I never order chicken fried steak here in Texas, because it is inferior to my mom’s fried cubed steak. Alton Brown’s version is close to the way we prepare it in the Carolinas, but we use more oil for frying, like Paula Deen. The Texas restaurant version has a thick, crunchy batter, that tastes bland to me. It is however very popular in Texas, so obviously lots of folks like it. Brown prepares the floured steak with the needler, then through flour again, then dredges both sides through egg batter, then flours a third time. He transfers the battered steaks onto a rack for 10-15 minutes. Brown then heats a thin layer of oil in a 10”-12” skillet and fries the steaks, careful not to crowd them in the pan, for four minutes per side. Transfer to wire rack and keep warm in a 250º oven while making the gravy. Add a small amount of additional oil to the skillet, and whisk in about three tablespoons of flour, then chicken broth, milk, salt, pepper, and thyme. Now we’re talking! 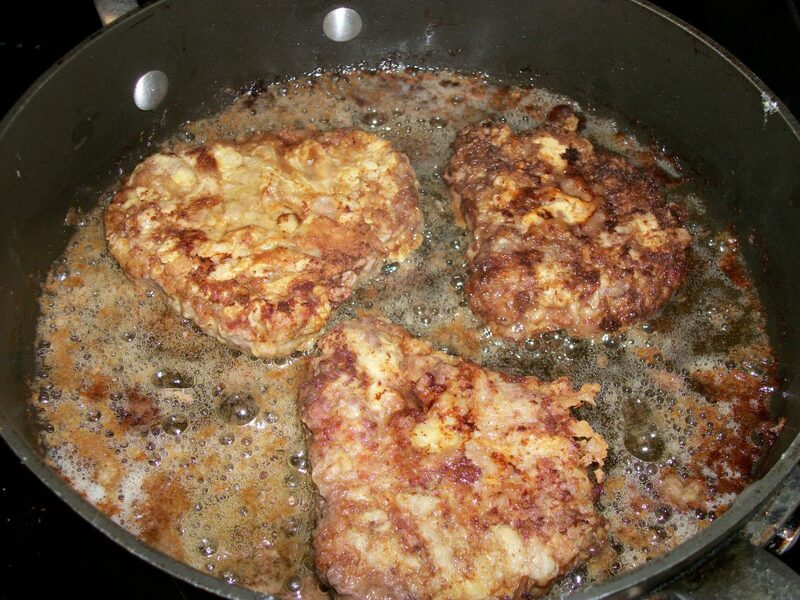 Paula Deen’s chicken fried steak, or country fried steak, looks like Mom’s, and is pretty much made like Mom and I make it. Unfortunately her video disappeared from YouTube, but her recipe is on Food Network. Paula seasons the steaks, then dips them in buttermilk before coating them in flour. 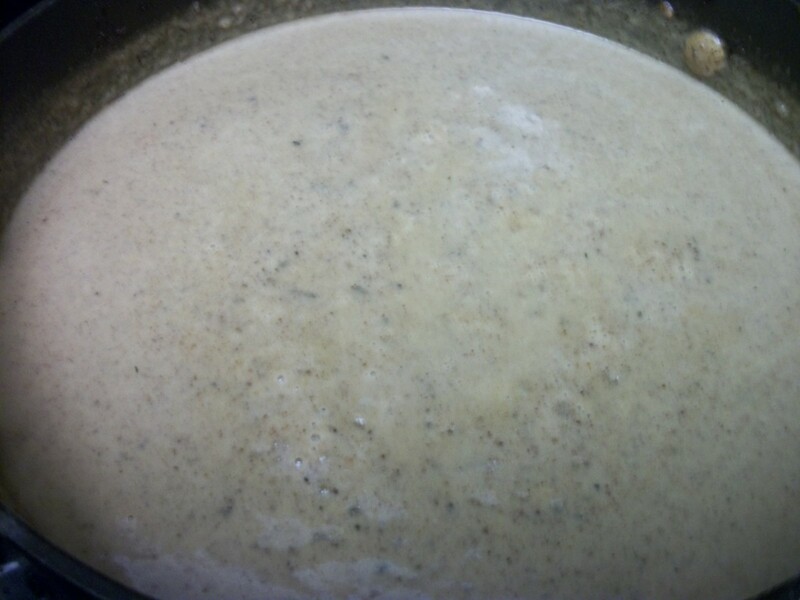 The buttermilk is to help the steaks hold a heavy coat of flour. My family uses egg instead of milk. Paula then fries the steaks in hot, deep oil for a few minutes on each side. My family uses about ½” inch of oil, considerably less than what is in Paula’s pan. My mom uses a cast iron skillet. I have a glass top stove, which means I cannot use cast iron. I use a 10” Caphalon deep side skillet, or our thick bottomed 12” Hamilton Beach stainless steel skillet. For the gravy, pour off all but several tablespoons of the oil. 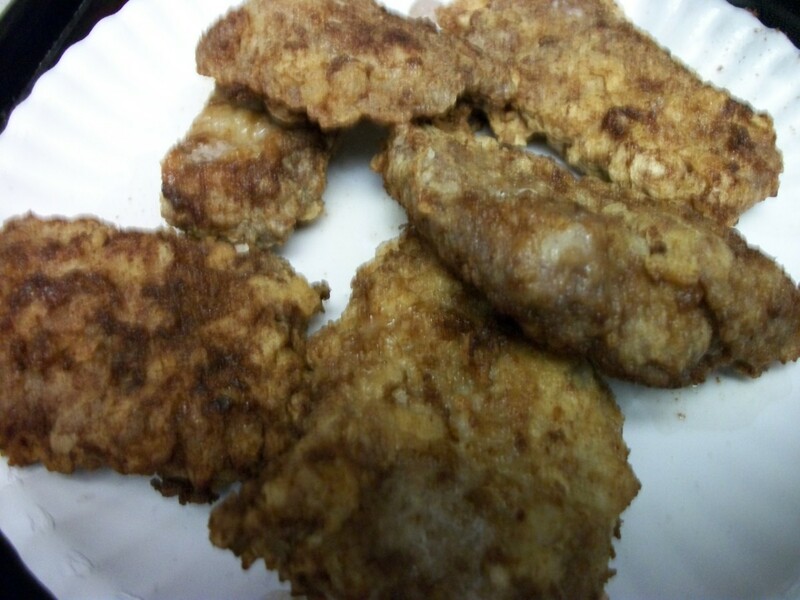 Stir several tablespoons of flour (depends on your altitude) in with the browned bits from the fried steak. Stir constantly, until flour is slightly brown. Add whole milk, stirring constantly. Season with salt and pepper. Fry seasoned steaks quickly on both sides in olive oil in a hot skillet. Remove steaks and set aside. Sauté chopped shallots, mushrooms, and garlic in butter. Add a splash of Worcestershire Sauce, and some Dijon mustard. Flambé with brandy. Swirl. Add cream and chopped parsley and return steaks to pan to finish cooking. 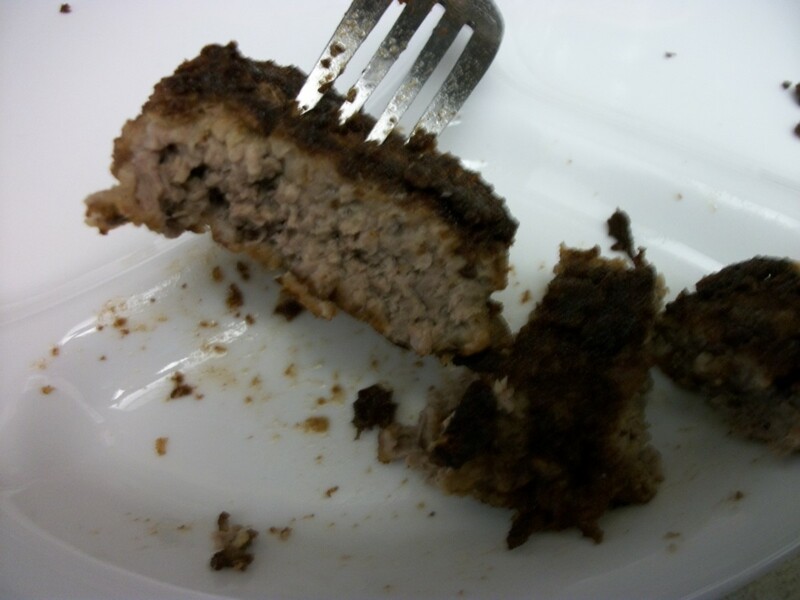 Here in PR, we do breaded cube steak, but we also cook in with onions, garlic and vinegar ("bistec encebollado").